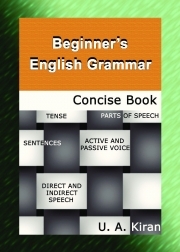 Description of "Beginner's English Grammar"
This book is to help you have a concise knowledge of English and English grammar. The examples would help you in good understanding and correct usage in written as well as spoken English. Indian students are generally not so interested in English Grammar, but they want to score better in the English language. Grammar sometimes dubbed as a boring subject. They fail to understand that without proper knowledge of grammar, their target of scoring better grade is unachievable. Beginner’s English Grammar is for those who want to gain some knowledge of grammar. This book would upgrade them from No Grammar to Some Grammar. In the book, I have concentrated on the parts of speech, Tense, Active and Passive Voice, Direct and Indirect Speech and how verb agrees with subjects. At the end, I have given the format of letter-writing. U. A. Kiran is a Commerce graduate, born in Kerala, educated in West Bengal, employed in Andhra Pradesh and now in Goa. He is interested in creativity like writing poems, stories, drawing, novelettes/novels, dialogues/dramas, chalk-shaping and making puzzles. His works are published by www.in.msn.com, www.ndtv.com and The Navhind Times. Reviews of "Beginner's English Grammar"